After his recent stoppage loss to Danny Garcia in New York, local favourite and former two-weight world champion Paulie Malignaggi appeared to decide that the time had come to bring the curtain down on his long career, emotionally announcing that his time to retire was nigh, and that he would be seeking to focus on his burgeoning, and successful career, as a ringside analyst for Showtime and Sky Sports in the UK. “I’m probably not fighting again,” Malignaggi said after the Garcia fight. However, as has been the case with so many fighters, so many times before, Malignaggi has had some time for reflection, and the regrets about the fight with Garcia have seemingly started creeping slowly in, with “The Magic Man” announcing to iFLtv that he is still undecided regarding the future of his boxing career. “I don’t know what to do as far as my boxing career, some days I wanna fight, some days I don’t, so we’ll see,” he said. 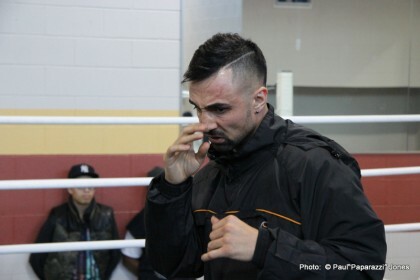 Speaking about the Garcia fight, it seems Paulie is having second thoughts about taking on a fighter of Garcia’s calibre without a tune up bout – like the one he was scheduled to have against Danny O’Connor before getting cut in training. “Some of the things I was thinking, was I couldn’t find the offensive distance, I couldn’t find the offensive rhythm, and at times I felt like I should’ve – I felt at times Danny was waiting too long but something in me was just not pulling the trigger,” he added. Though definitely don’t rule out a return just yet. According to Paulie, if the right opportunity lands in his lap? And thanks to his Italian heritage, that could include a shot at European honours. “I don’t know. (If I’ll fight again) A piece of me will always wonder if maybe I could, if maybe I should, but then another piece of me will try and fight that off ’cause maybe I shouldn’t, and maybe I couldn’t. I’ll always kinda leave the door open and see what’s going on. Previous boxing news: Cherviak Q&A: ”I’m coming to Sweden to spoil Skoglund’s celebrations!